Free Printable Mardi Gras Trivia. Free Printable Mardi Gras Trivia Quiz that you can share with your friends to celebrate Fat Tuesday this month of March. Let’s find out how much you know about Mardi Gras. Try to answer this trivia about the Mardi Gras facts and about Mardi Gras Society, King Cakes, Celebration, Costumes, Masks, Dates, Floats, Parades, Beads, Colors, Origin, Ladders, and many more. The guest with most correct answers wins. 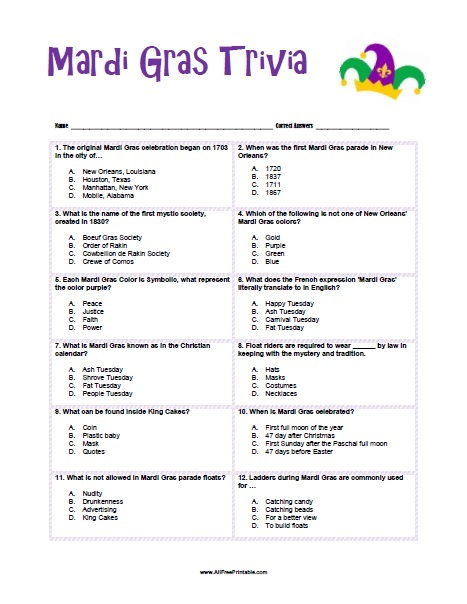 The trivia game includes 12 Mardi Gras trivia quiz questions and the answers sheet on page 2 (answers in bold). Print as many as you need. Happy Mardi Gras! Free Printable Presidents Day Trivia. Free Printable Presidents Day Trivia Quiz that you can share with your students and friends to celebrate George Washington’s Birthday and Presidents Day this month of February. Let’s find out how much you know about Presidents Day. Try to answer this trivia about the Presidents Day facts about Presidents like Donald Trump, Abraham Lincoln, Grover Cleveland, Richard Nixon, Franklin D. Roosevelt and many more. The guest with most correct answers wins. The trivia game includes 12 Presidents Day trivia quiz questions and the answers sheet on page 2 (answers in bold). Print as many as you need. Happy Presidents Day! Free Printable Flag Day Trivia. Free Printable Flag Day Trivia Quiz that you can share with your students and friends to commemorates the adoption of the flag of the United States on June 14, 1777. Let’s find out how much you know about Flag Day. Try to answer this trivia about the Flag Day facts, Flag Day history, Flag Day important dates, Flag Day stars and stripes, Flag Day Parades, Flag Day presidents and more. The guest with most correct answers wins. The trivia game includes 12 Flag Day trivia quiz questions and the answers sheet on page 2 (answers in bold). Print as many as you need. Free Printable Memorial Day Trivia. Free Printable Memorial Day Trivia Quiz that you can share with your students and remember the people who died while serving in the country’s armed forces. Let’s find out how much you know about Memorial Day. Try to answer this trivia about the Memorial Day facts, Memorial Day history, Memorial Day important dates, Memorial Day Movies, Memorial Day Parade and more. The guest with most correct answers wins. The trivia game includes 12 Memorial Day trivia quiz questions and the answers sheet on page 2 (answers in bold). Print as many as you need. Free Printable Father’s Day Trivia. Free Printable Father’s Day Trivia Quiz for your next Father’s Day Party or celebration this summer. Let’s find out how much your guests know about Father’s Day. Try to answer this trivia about the Father’s Day fun facts, Father’s Day history, Father’s Day gifts, Father’s Day movies, Father’s Day songs, Father’s Day flowers and more. The party guest with most correct answers wins. The fun trivia game includes 12 Dad’s Day trivia quiz questions and the answers sheet on page 2 (answers in bold). Print as many as you need. Have fun at the Father’s Day Party. Happy Father’s Day! Free Printable Mother’s Day Trivia. New Free Printable Mother’s Day Trivia Quiz for your next Mother’s Day Party or celebration. Let’s find out how much your guests know about Mother’s Day. Try to answer this trivia about the Mother’s Day facts, Mother’s Day history, Mother’s Day Gifts, Mother’s Day Movies, Mother’s Day Songs, Mother’s Day Flowers and more. The party guest with most correct answers wins. The fun trivia game includes 12 Mother’s Day trivia quiz questions and the answers sheet on page 2 (answers in bold). Print as many as you need. Have fun at the Mother’s Day Party. Happy Mother’s Day! Free Printable Star Wars Trivia Quiz. Print the new Free Printable Star Wars Trivia Quiz and use for your next Star Wars party or just to have fun. Before you watch the next movie find out how much you know about Star Wars. Share wit your friends this trivia from Star Wars movies, Star Wars characters, like Star Wars the Last Jedi and Star Wars The Force Awakens. Find more about Finn, Droids, Rey, Kylo Ren, Han Solo, X-Wing, TIE Fighter, Stormtrooper, Supreme Leader Snoke, Planets. The participant with most correct answers wins. The trivia quiz includes 12 Star Wars questions with the answers in bold on page 2. Click the link below to download or print the Star Wars Trivia Game now in PDF format. May the Force Be With You! Free Printable Stranger Things Trivia. New Free Printable NETFLIX Stranger Things Trivia Quiz for your next Stranger Things Party. Let’s find out how much you know about Stranger Things. Try to answer this easy trivia about the Stranger Things Facts, Stranger Things Locations, Stranger Things Food, Stranger Things Games and Stranger Things characters. The party guest with most correct answers wins. The fun trivia game includes 12 Stranger Things trivia quiz questions and the answers sheet on page 2 (answers in bold). Print as many as you need. Have fun waiting for the next season episodes solving this free printable Stranger Things trivia quiz game! Free Printable Cinco de Mayo Trivia. New Free Printable Cinco de Mayo Trivia Quiz for your next Cinco de Mayo Party or celebration. Let’s find out how much your guests know about Cinco de Mayo. Try to answer this trivia about the Cinco de Mayo facts, Cinco de Mayo battle history, Cinco de Mayo drinks, Cinco de Mayo food, Cinco de Mayo places and more from Cinco de Mayo Day celebration. The party guest with most correct answers wins. The fun trivia game includes 12 Cinco de Mayo trivia quiz questions and the answers sheet on page 2 (answers in bold). Print as many as you need. Have fun at the Cinco de Mayo Day Party with this free printable Cinco de Mayo trivia quiz game! Free Printable Christmas Trivia Game. Free Printable Christmas Trivia Quiz for your next Christmas Party or family reunion. Let’s find out how much your guests know about Christmas. Try to answer this medium dificulty trivia about the Christmas Songs, Christmas Food, Christmas drinks, Christmas movies, Christmas places, Christmas gifts and more from Christmas Day celebration. The participant with most correct answers wins. The fun trivia game includes 12 Christmas trivia quiz questions and the answers sheet on page 2 (answers in bold). Print as many as you need. Have fun at the Christmas Day Party with this free printable Christmas trivia quiz game!